I'm officially old. 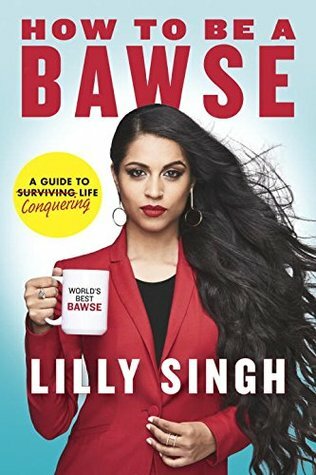 I didn't know about Lilly Singh or her meteoric popularity and youtube stardom as ||Superwoman|| until I saw this book in my library. But I sure do now! I was interested in reading about how she approaches her life as a "bawse". What is a bawse? "A Bawse is a human being who exudes confidence, turns heads, reaches goals, finds inner strength, gets hurt efficiently and smiles genuinely- because they've fought through it all and made it out the other side." Essentially this is a book about personal achievement and business advice for the young. After you've read this empowering set of brief essays on life skills and attitudes for success, you might age a little and read some Danielle Laporte for personal and business advice for the fiery female leader, and then age a little more and read some business advice about leadership, commitment and integrity from Arlene Dickinson. This book is high energy (as Singh is). It's made up of 50 short chapters on different aspects of business and life success. Each one opens with a highly coloured photo of Singh in a costume or outfit themed to the topic. The paper stock is heavy and glossy and the chapters also include the very trendy full-page text pop-outs in varied Instagrammy fonts and colours. It's an eye catching and active style that is made for short attention spans and bites of reading time. It also means there is not a lot of space to go deep, but I find that's not what these kinds of books are for. However, I did find that Singh has some good stuff to share, emphasizing hard work, kindness to others, and persistence. In a bawse world there are no escalators, there are only stairs. And in the end, that's really the message of her book and her career, as she shares it: you've got to hustle to get what you want. Always work hard, focus on your goals, take opportunities that arise, and make opportunities, too. I liked her repetition of the concept of hustle NOT including meanness -- she restates a couple of times that being courteous and respectful is important, and that being kind and knowing which rung of the ladder you're on doesn't mean getting walked over. And she certainly has hustled, all the way from Scarborough to LA, and from one youtube video to hundreds of them, some viewed over 20 million times. And a world tour. And more. Procrastination is a hustler's worst enemy. Thank you for defining Bawse. This sounds like an entertaining and valuable book, especially for women (of all ages). Excellent review! I will keep this book in mind.